Guests who have visited Disney's Art of Animation Resort (Walt Disney World) may have noticed the unique chandelier that hangs in the center of the lobby. 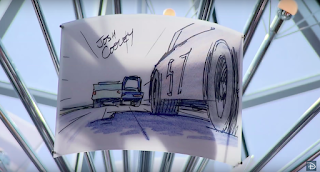 This creative piece showcases 77 storyboard panels from the four feature films that make up the resort — Cars, Finding Nemo, The Lion King and The Little Mermaid. Over the past few years numerous artists, filmmakers and actors have signed storyboard panels featured on the chandelier. Recently, Toy Story 4 co-director Josh Cooley visited the resort where he signed a Cars themed storyboard panel to add to the chandelier. Watch the event video below featuring a look at the unique chandelier as well as listen to Josh's comments.